CAPE CANAVERAL — A military communications satellite, built with international funding from Canada, Denmark, the Netherlands, Luxembourg and New Zealand, has been stacked atop a Delta 4 rocket to launch into a worldwide information-relay network operated by the U.S.
WGS 9, the ninth installment of the Wideband Global SATCOM communications satellite system, will be boosted into a super-synchronous transfer orbit by the United Launch Alliance Delta 4 Medium+ (5,4) configured rocket with four strap-on solids. Liftoff is planned for March 8 during a window of 6:48 to 7:53 p.m. EDT (2248-2353 GMT). The allies bought this satellite in exchange for access to the planet-spanning constellation, similar to the groundbreaking deal with Australia that paid for the construction and launch of WGS 6. 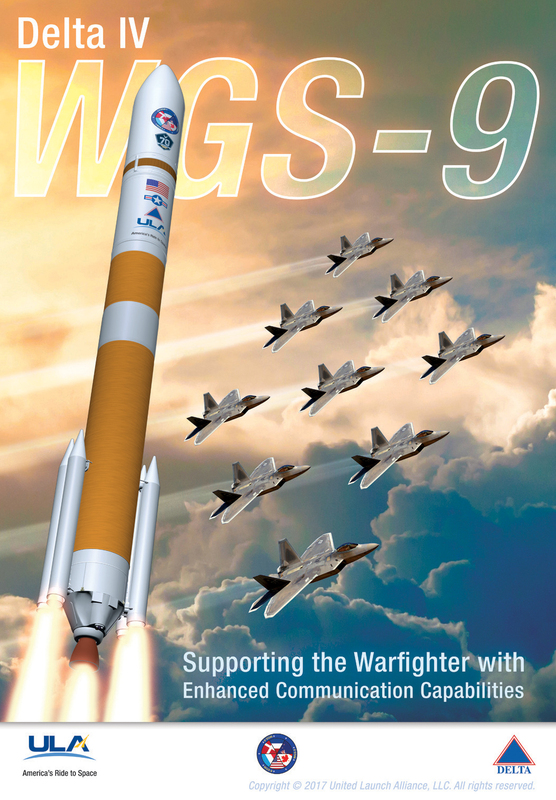 “Each of the partners receive resources commensurate with their investment with WGS 9…Commensurate investments from these partners equate to approximately 3 percent of the WGS constellation bandwidth,” according to answers provided by the Air Force’s Space and Missile Systems Center. The international participation gives communications interoperability between allied forces, funds expansion of the constellation and allows each partner nation to make a modest investment to receive immediate access to worldwide services that would be too expensive to construct on their own. The WGS 9 deal was signed in 2012 to begin construction of the satellite. WGS is the Department of Defense’s highest capacity communications satellite system. 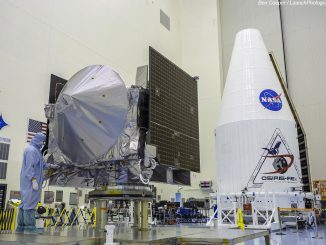 The spacecraft create a global grid to provide the needed coverage and connectivity in support of operations by U.S. and allied forces around the world. 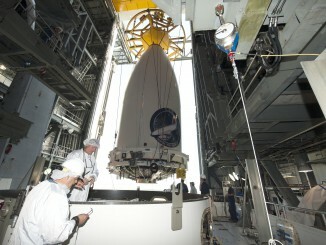 Boeing builds the WGS satellites, which began launching in 2007. The new bird, valued at $424 million, will be maneuvered into a circular geosynchronous orbit 22,300 miles above the equator to enter service from an undisclosed position. Just like WGS 8 launched in December, No. 9 carries the second Wideband Digital Channelizer at the heart of its communications package, enabling a 90 percent improvement in available bandwidth compared to previous sister-satellites. Already shrouded in the rocket’s 47-foot-tall, 17-foot-diameter composite nose cone, the WGS 9 spacecraft was hauled to Complex 37 overnight and hoisted atop the Delta 4 launch vehicle today. The fully assembled rocket stands 217 feet tall. “The international partners funded the procurement of the ninth WGS satellite. The United States funded the launch, operation and sustainment of WGS 9,” according to SMC. The satellite was flown to Florida in early January from Boeing’s manufacturing facility in El Segundo, California. After arriving, it was taken to the commercial Astrotech processing facility to undergo pre-flight preps. Final testing, loading of maneuvering propellant and encapsulation in the Delta 4’s nose cone was accomplished with the satellite. Today’s transfer to the pad saw the 13,000-pound satellite move from Titusville, through the Kennedy Space Center and over to Cape Canaveral Air Force Station’s Complex 37. Since rolling from its hangar a month ago, the Delta has undergone attachment of the four solid boosters and a pre-launch testing campaign. A fueling exercise was performed just last week. Delta 377 will be the rocket family’s first of 2017. See earlier WGS 9 coverage.